Churakka Van Payar Erissery is a healthy vegetarian side dish, that is highly nutritious with vitamins, fibers and proteins. Bottle gourd is considered as a super vegetable and is commonly known as Churakka, Surakai, Lauki or Doodhi in India. It has high water content and is a rich source of vitamin C, K, Iron and calcium. It helps in controlling bad cholesterol levels, keeps your heart healthy and aids in digestion. Lauki juice stabilizes blood sugar levels in the body and helps to reduce urinary tract infection. Along with Cow peas or Vanpayar, churakka is a great healthy combo. 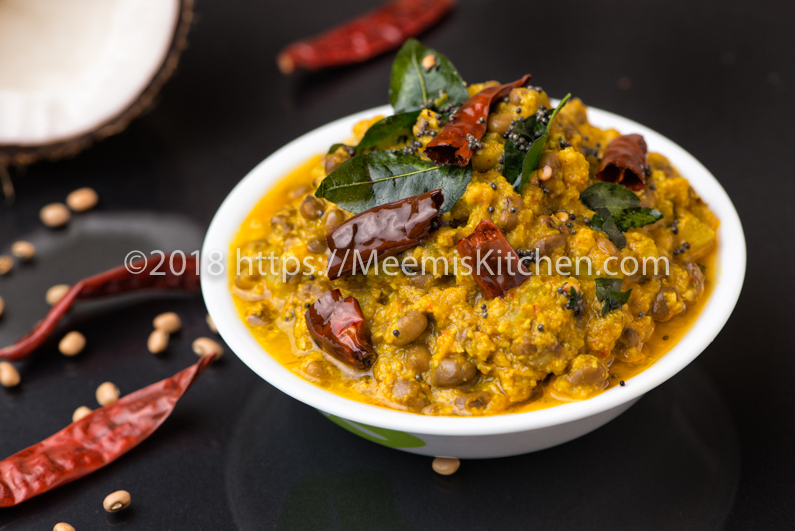 As I have told you before, Vanpayar (cow peas) or cherupayar (mung) dishes are very popular in my family and we have myriad dishes and combinations involving these pulses. Do check my Vazhakka Cherupayar Thoran, Cabbage Cherupayar thoran, sprouts thoran, Vanpayar thoran, Vazhakoombu cherupayar thoran, Koottu Erissery, Vanpayar Kaya puzhukku, Vanpayar Ularthiyathu, Cherupayar Ularthiyathu. In Kerala, rice is staple food with thoran and mezhukkupuratti and a lavish amount of coconut and coconut oil in every dish. Erissery is a festive dish made usually with pumpkin or yam prepared in a ground coconut paste and garnished with roasted coconut. Churakka and van payar erissery is tasty and nutritious, a variety side dish to serve with rice. Pair it with Kadachakka Mappas or Vendakka Mappas and enjoy! Churakka or Bottle gourd prepared with lentils, bottle gourd thoran and Churakka chemmeen curry are all popular in Kerala. In South India, Dudhi/ Ghiya/ Churakka Parippu curry is quite famous. This Churakka Erissery is quite simple to prepare and you will love the delicious combination of Vanpayar and Lauki. Here is the wonderful recipe for Churakka Vanpayar erissery. Enjoy! Small Onion/ shallots : 4 -6 nos. Green chilly : 1 – 2 nos. Curry leaves : 3 sprigs. Red chilies : 2 nos. 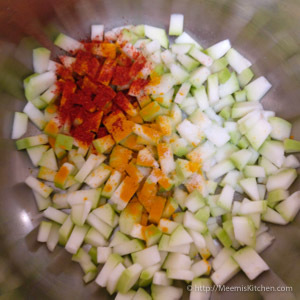 Scrape/ Peel the skin of Bottle gourd/ Churakka; cut the edges. Cut vertically, remove the seeds and soft, spongy insides. Wash well and cut into small squares and cook immediately with enough water (½ cup), a pinch of turmeric, ½ tsp chili powder and salt. Soak the Vanpayar for 5 hours or more. Cook in the pressure cooker with enough water till soft. Slightly mash the Lauki and add the cooked vanpayar. 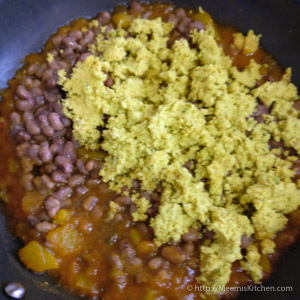 Grind scraped coconut with turmeric powder, Jeera/ cumin, green chili, garlic, small onion and few curry leaves. The coconut paste should be slightly coarse and not smooth. Add this to the churakka payar mix. Cover and cook for three to four minutes on low flame to cook the ground coconut mix. Combine everything together and adjust the salt. In a small pan, heat coconut oil and crackle mustards. Add curry leaves, sliced onions and dry red chilies. Add I tbsp scraped coconut (optional) and fry till golden brown. Garnish Churakka Payar erissery with this and serve hot with rice and Kalan. Yum! Churakka or bottle gourd should have a smooth silky light green skin. Always use fresh ones. 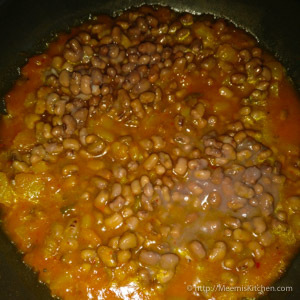 No salt should be added while cooking VanPayar / Red Cow Peas. Soak VanPayar for 5 hours or more or keep it soaked overnight. Coconut should be coarsely ground. 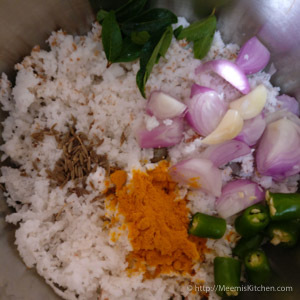 Add curry leaves while grinding coconut. Make sure you mash churakka slightly. You may cook in pressure cooker till one whistle, for perfect cooking. Include this Bottle Gourd Cowpeas erissery in your weekly menu for a healthy diet. Hope all of you would try this recipe. Let me know if you like it or share with your friends using the buttons on the side. God Bless!